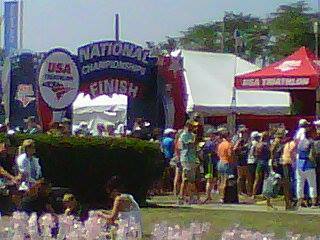 The whole weekend was great despite waiting in line for race packet pickup and to check my bike into transition. 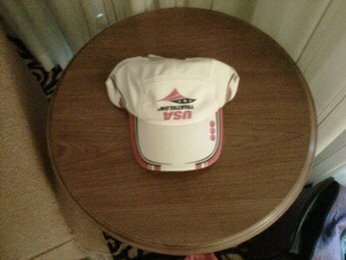 I was also upset to learn that I would not be getting the official race jacket at the race and the hat in my bag has the USAT logo upside down. I have yet to receive my jacket in the mail several weeks after the event. The elite super sprint triathlon was great was also a highlight of the weekend. That event is one I would like to do in the near future. This was it. It was time to start and finish race that I decided to make my goal race of 2014. This was decided when I crossed the finish line in the 2013 National Age Group Sprint Championships. 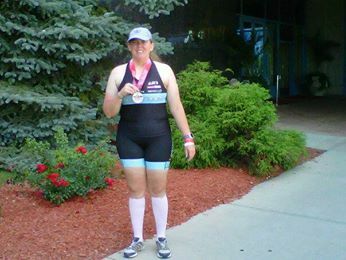 It was then, when I made the attempt to finish the triathlon less than three months after having brain surgery, after 6 weeks of oral chemotherapy and only 10 days after finishing 33 radiation treatments for anaplastic astrocytoma in the left frontal lobe of my brain. Now a year later I was still alive and ready to race again. Like last year prior to my diagnosis, I expected to be competitive by finishing in the top 25 in my age group. My training had been going well even during my monthly cycles of oral chemotherapy which ended in January. 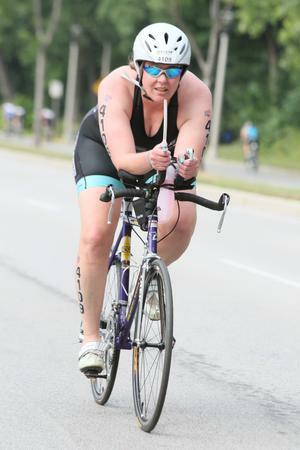 I had joined the Cyclone Triathlon Team last fall and tried to attend at least 1 swim session and 1 cycling session. In April, the day of the Minnesota State Masters short Course Swim Meet I caught a virus which plagued me for most of the spring and early summer. This virus caused an exacerbation of my asthma and chronic cough that made it difficult to train. Like last year I still expected to race hard and do the best I could. Race morning began at 4:15 when I woke up had my coffee and oatmeal. Then I prepared my electrolyte race beverage Next I donned my Cyclones Triathlon Team kit and TriRochester long sleeve shirt and pants. It was a cool morning so it was a good choice. I had already applied my race numbers the night before to save an extra race morning step. It was time to head to the race site which was about a 17 minute drive from my hotel. Once I arrived in the transition everything went smoothly. I unpacked my race bag and sent up my transition for the big race. The fancy bikes and equipment other athletes had around me was intimidating. 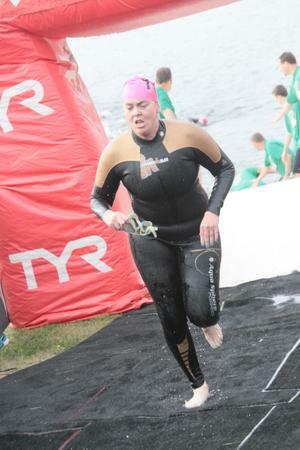 I left the transition with my wetsuit on and my cap and goggles in hand for the swim start. This year was nice as I would not have to wait around 1 hour prior to getting into the water as I was in the second heat and was able to warm up for longer in the water prior to the start of the race. As I climbed down the ladder into the cool Lake Michigan waters, I was comforted and confident that my swim training with the Cyclones Tri Team would get me to the end of the swim fast. The horn sounded and I was positioned in the back of the pack. I waited about 5 seconds before I started swimming to avoid splashing water and the mess of the pack. I stayed close to my strategy of swimming towards the buoys and staying on the inside but yet swim around them. About half way through the swim, I aspirated some water and started coughing. 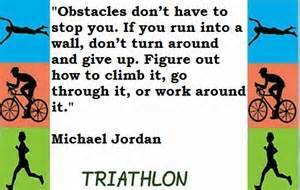 It took about 30 seconds of me swimming above water breaststroke to catch my breath enough to continue swimming. After finally starting to swim again, I swam strong and fast to the swim exit. Up the metal ramp I went grabbing the hands of volunteers that were assisting us. Swim 750 meters in 15:50. 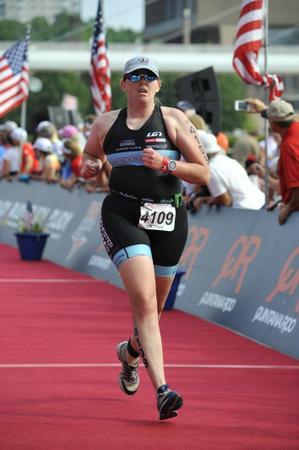 To the transition I ran, I actually ran out of the swim to the transition area. 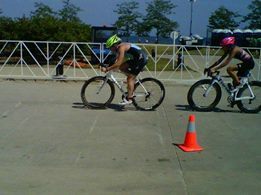 In the transition area I quickly changed into my bike shoes and helmet and sprinted out. As I began to ride my bike I focused on pacing to not start out too fast. People began to pass me but I held my own. The worse pass I got was a man who passed me and began going slow. Everyone was passing me and I could not pass this man. I could not even pass him at the turnaround. Once I got past the turnaround I passed him never to be seen again. Overall, I was not happy with my bike time, but I had spent little time training for the bike so I had no excuse for a slow time. Bike 12.5 miles in 44:18. I rushed into the transition and headed out to the run. Using an interval timer from Jeff Galloway to set these intervals, I planned to run/walk with a ratio of 4 minutes running to 1 minute walking. The run actually went by fast. I had people cheering me the whole way and even while passing me they said, “good job, keep going.” I replied “good job” in response. I just stuck to my plan and the fact that people passed me did not concern me. 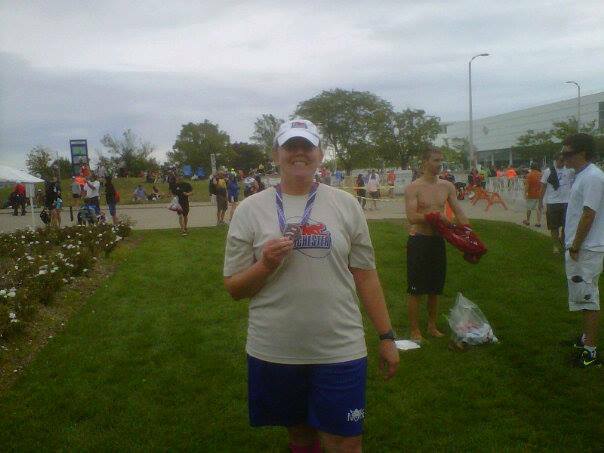 The finish line came up quickly and I sprinted to the finish and ran across the line again hearing Karen Smyers call my name, “here is Dawn Johnson from Rochester, MN.” I finished the 5K in a total run time of 34:36 and a total for the triathlon of 1:40:45. Overall, I finished 71/81 in my age-group. When I finished I headed to the post-race lunch, cheered other triathletes to the finish, enjoyed the beautiful weather, and gave God thanks that I can still tri. BRAVO, DAWN! I’m so very happy for and proud of you! you are TRULY an inspiration.